This week I’m glad to host the Carnival of Money Pros live from New Orleans. I’ve been here since Wednesday for the Christian Community Development Association’s national conference. It’s one of my favorite events of the year, with lots of networking and workshops centered around church-based economic and community development, social enterprise, micro finance, and more. New Orleans is also one of my favorite places to be. I can’t get enough of the culture, music, food, history, architecture, etc. 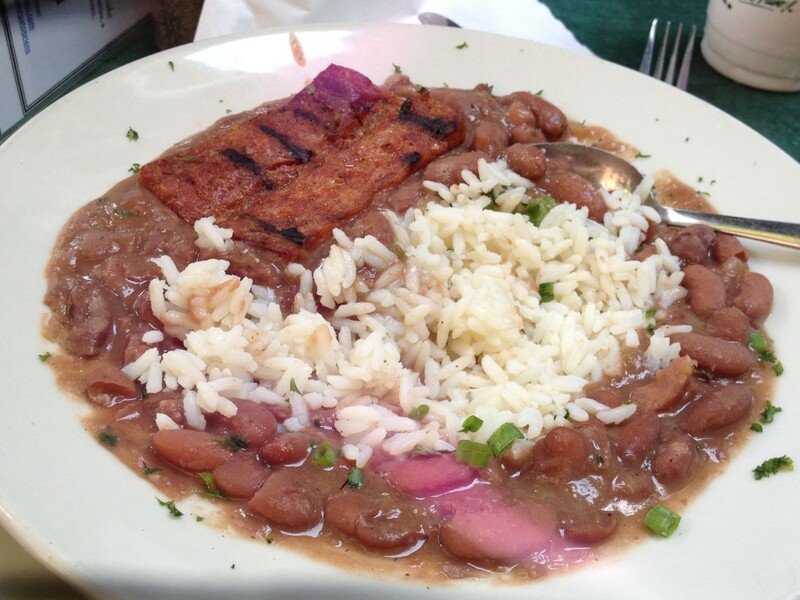 New Orleans’ famous Red Beans and Rice from Pat O’Brien’s Piano Bar on Bourbon Street. One of my favorite meals – Red Beans and Rice – makes me think of Dave Ramsey, who always says when you’re trying to pay down debt and save money, you need to eat beans and rice and rice and beans. But in New Orleans, a bowl of Red Beans and Rice will set you back around $12.00! Well, without further adieu, let’s get to the Carnival of Money Pros. There were a ton of great selections this week. Thank you to everyone who submitted! Adam @ Money Bulldog writes Would Taking on a Second Job Suit You? – Many people have at some time in their life considered a second job, but would a second job suit you? Adam @ Money Rebound writes Could You Afford to Retire Early? – Taking early retirement is a dream for many people in full time work. So can you afford to retire early or will it remain just that, a dream? GMM @ Grad Money Matters writes 4 Tips for Saving Money Running a Retail Store – Running your own retail store can certainly be an exciting business venture, and you’re likely to make some headway if you have a good plan. However, you probably don’t want to spend all your startup capital just in case you need some cash on hand in the first few months. When faced with this scenario, you have to ask yourself. Michelle @ Diversified Finances writes What I’m Doing to Prepare for Self-Employment – A couple of months ago, I published a post on Making Sense of Cents about How To Prepare for Self-Employment. I am planning on making the switch relatively soon, and I wanted to publish an update to that post. Alexis @ FITnancials writes Save Money on Food AND Eat Healthy – I’m on a budget, and a kind of strict one as well. Since I am on a budget, I am always looking for ways to save money on food. Some people spend hundreds and hundreds of dollars on each person in their family on food. Some families have food budgets in the thousands each month, which amazes me! Michelle @ Making Sense of Cents writes $9,554 in August Extra Income – Looking for Affiliate Income – August was a slower month than usual. I also took a vacation, so I will blame not being able to reach my $10K goal on that. However, I did receive an uptick in the amount of bids I put out. I received many emails from business owners who were interested in hiring me. Hopefully some of these pan out! Jordann @ Making Sense of Cents writes Minimalism 101: One Thing a Day – The problem is, once I start cleaning and eradicating clutter, I sometimes get carried away and before I know it, half of my house is torn apart, and I’ve been so busy flitting from one project to the next that I haven’t been able to actually get rid of anything. Maybe it’s the millennial in me, but when I’m at home, sometimes I have a hard time concentrating on just one project, and completing it, before moving on to the next thing that catches my eye. AB @ Aspiring Blogger writes Net Worth Update – July 2013 – My 100th blog post and an increase in our net worth? Doesn’t get much better than that! Stop by and read all the details. Daniel @ Make Money Make Cents writes What is your Debt to Credit Limit Ratio? – Having credit is a vital part of any adult life but knowing when and how to use it is actually more important bit of financial knowledge that all people need to have. Oscar @ Money is the Root writes 3 Free Online Retirement Planning Tools – Many retirement plan providers as well as a number of financial planning service providers have added online tools to their mix of services to better help their customers plan for retirement. Jay @ Daily Fuel Economy Tip writes What’s the deal with fuel efficient, low rolling resistance tires anyway? – Fuel-efficient tires aren’t new to the market to be sure but, as far as being able to purchase them at your local tire shop, they are definitely something new. Danielle @ Saving Without a Budget writes Planning your Retirement? Here are 8 Mistakes to Avoid – A recent national survey showed that over 85% of all respondents weren’t confident that they would be able to retire comfortably based on their current retirement plans. Matt @ Budget Snob writes Easy Ways to Start Saving – Today we live world where being a big spender is a symbol of status and is seen as positive, but saving money and frugality were once considered great virtues. Amy @ Money Mishaps writes Top Tips for Saving Money on Groceries – One of the largest costs that most families face is the cost of food. Indeed, just as the cost of gasoline has shot up in the last few years, the cost of food has shot up as well. Justin @ Digit Fox writes Renting Versus Owning – Have you ever noticed how renting seems to carry some negative stigma with it? People are all in favor of going into debt to own an asset, but should you temporarily borrow said asset all of a sudden it becomes the worst financial move you can make. Lenny @ Best Money Saving Blog writes 10 Excellent and Frugal Finance Tips – Today it seems that everyone is looking for financial advice to help them save as much money as possible, and rightly so. With the cost of gasoline, food and clothing inching ever higher, saving a few dollars here and there can actually add up to quite a bit at month’s end. Andrea @ So Over This writes Getting Your Child to Contribute Towards Education Costs – Every parent wants their child to have a good education and be able to enjoy a prosperous and rewarding future. However, even the cost of higher education can be crippling for some parents. Bob @ Dwindling Debt writes 50 Excellent Tips to Improve Your Finances Part 5 of 5 – We have 10 more excellent tips for you on how to improve your finances right now! Lily @ Paying Debt Down writes Top personal finance tips for young adults – As with many things in life, learning to handle finances correctly takes time and practice. Unfortunately, very few people ever get the education and direction that they need and so must learn how to handle finances on their own. Katie @ IRA Basics writes When Buying a House Becomes a Headache – Whether you are a first-time buyer, second-time buyer or any other multiple-of-times buyer, getting hold of your dream home can be a really exciting time. Sam @ The New Business Blog writes Hobby or Business in the Eyes of the IRS – Statistics are showing that the number of home businesses and side businesses has been growing of late as the economy has turned south. Jack @ Money Saving Ethics writes What Can Financial Planners Do For You? – One subject that, unfortunately, is not taught in high school is the subject of financial planning. The simple fact is that everyone, no matter who they are, will have to deal with finances and financial planning as adults. Monica @ Monica on Money writes 7 Things I Refuse to Give Up to Save More Money – I love saving money (who doesn’t) and some would even say I’m cheap! So I recently started looking for ways to save money on everything, but there are 7 things I refuse to give up to save more money. Holly @ Club Thrifty writes Quit Your Day Job: How to Start a Blog – Yup! We work from home and it all began when we started a blog. How can you make money online and possibly quit your day job? Find out inside! Daniel @ SweatingTheBigStuff.com writes When You Should Pay Bills Manually – I’ve automated just about everything, but there are a few times I still pay bills manually. There are only two reasons not to automate bills. Buck @ Buck Inspire writes Workplace Productivity In America – Due to Baby Buck’s ever changing sleep patterns, my energy levels have been all over the map. I’ve been compensating by taking quick power naps during my lunch break. Take a look at workplace productivity and another way to deal with low energy. Martin @ Studenomics writes The Article About Money I Wish I Read Before College (Open Letter to All Students) – What you really need to know about your finances. Suba @ Broke Professionals writes Without the Kids – Save Money, Enjoy Life – Having children is one of the most rewarding things we do in life. But if you decide to go a different path, why not explore life these ways. Lauren @ L Bee and the Money Tree writes Why You Should Choose Stocks – Here are 5 reasons why you should choose stocks as your primary investment. Rich @ Growing Money Smart writes 100K in Five Years Challenge Update 2013-09-09 – We’ve changed out five year challenge strategy, but we still think we can meet our goal of 100k in five years. Ted Jenkin @ Your Smart Money Moves writes You Are A Sole Proprietor: How About A Solo 401(k) – I am seeing more and more people quit the corporate America lifestyle and venture into becoming their own business owner. Jacob @ AllPersonalFinance writes Managing Your Medical Bills – Even the healthiest and most cautious of people can find themselves burdened with massive medical expenses when the unexpected happens. Accidents and illnesses rarely give warning or discriminate between those who can handle them financially and those who cannot. This is why it is crucial for all people to take the necessary steps to manage. Mr. Utopia @ Personal Finance Utopia writes How to Become Rich – If you believe earning a higher salary is the key to become rich then think again. Learn how the country’s wealthiest become rich and copy their approach. Richard Adams @ Frugality Magazine writes Ways To Save Water At Home And Reduce Your Bills By $184 – According to the EPA the average American uses 100 gallons of water per day at home. However by understanding all the various ways to save water it’s possible to reduce your household water bill by approximately 30% – while helping the environment too. Maria @ The Money Principle writes Two strategies for financial independence and matters to consider – In this article I discuss two strategies for financial independence and the matters one ought to consider within each of those. Emily @ Evolving Personal Finance writes How to Cancel Your Cable When You’re Addicted to a Show – One reason cable customers hesitate to cut the cord is because they are addicted to individual shows. Here are some strategies for getting rid of your cable while not sacrificing your wants. CAPI @ Creating a Passive Income writes Stepping Up: 5 Tips for Getting Promoted – There are simple actions anyone can take to position themselves for career advancement. Here are 5 tips for getting promoted in any work environment. Mike @ Personal Finance Journey writes Should I use credit card or cash? – When spending should I use credit card or cash? Should I risk some interest fees on the card or make smart use of my cash. An easy answer to the question. Debt Guru @ Debt Free Blog writes iSave: 5 Financial Apps That Help – Whether it is basic budgeting, shopping help or advanced account monitors, there are apps that will help. Read here for some of the greatest on finance! Tushar @ Start Investing Money writes Preparing Financially for 2014 – Is it too early to start thinking about another year? Many would say it is, since we are only just completing the summer months. Halloween is still a long way off, let alone the idea of Christmas and another year beyond it. FI Pilgrim @ FI Journey writes Imagine The Freedom Of Owning A House With No Mortgage – What would your life be like if you owned your home free and clear? How would having a house with no mortgage payment every month free your money up? LaTisha @ Young Finances writes How Much Do We Save to Buy a House? – Let me start by saying that I have never purchased a house, so researching this post was a great exercise for me and it actually convinced me that I should not rush into renting and instead focusing on saving money to become a homeowner. Kyle @ The Penny Hoarder writes The 4 Best Lottery Winner Stories – Whether you go to the gas station or convenience store and pick up your lottery ticket or instead frequent a site like William Hill 49s, you likely play the lottery because you dream of winning it big. MMD @ My Money Design writes How to Make Money with a Website and Why Most Personal Finance Sites Don’t – If you’re wondering right now how to make money with a website or why your’s isn’t doing as well as you hope, then you really need to hear Jon’s story! He’s killing it making $3,000 per month! MMD @ IRA vs 401k Central writes What Is a Non Deductible IRA and How Do I Contribute To One? – Very few people realize that you can contribute to a non deductible IRA regardless of your income level and still enjoy tax free investment growth. Here are some things that can help you get the most out of your savings. DW @ Great Passive Income Ideas writes What Are Some Good Online Residual Income Opportunities? – The Internet has got some great online residual income opportunities that will help you earn that extra cash you need. Here are a few tips you can try. Luke @ Learn Bonds writes 6 Things to Like About Treasuries – I am frequently amazed by the plethora of financial pundits that will openly admit they can’t think of any reasons why investors should own Treasuries. Mr FD @ Financial Debauchery writes Cool Checking Account Promotions from Banks that Want Your Business – Fortunately when banks want your business they offer some really cool checking account promotions to entice you. See how you can take full advantage of them! DW @ No Exam Life Insurance Guide writes Want a No-Needles Plan? How About a No Physical Life Insurance Policy – Unfortunately traditional plans require a medical exam before they will insure you. No physical life insurance can make this process a lot less stressful. Here are a few of the benefits. Roger the Amateur Financier @ The Amateur Financier writes 13 Ways to Control Your Student Debt – With fall upon us, it’s time for the leaves to start changing, the air to start getting brisker, and of course, the students to return to the colleges. krantcents @ KrantCents writes 25 Odd Jobs that Make Good Money – Ever wondered how people end up in most unusual jobs? The reasons for taking up odd jobs could be many, such as making quick money, realizing passion or yearning to do something new and different. Sometimes these seemingly odd endeavors turn out to be great platforms for building personally rewarding professions. ETZ25 @ Entertainment Timez writes Flashlight Tag Remembered – A Fun Frugal Game – A incredible fun frugal game from my childhood was a game called Flashlight Tag. For me, it was a very positive experience and one that I’m happy to share! Christopher @ This That and The MBA writes Important Factors For Solicitors When Choosing A Third-Party Litigation Funder – Best, briefly defined as the’ financing of litigation by an independent person(s) not party to the litigation, in return for a share of the winnings where the outcome is successful’, third-party litigation has grown rapidly in the past five years. Dollar @ Easy Extra Dollar writes Make Money – the Details on Doing Surveys – By doing a search, you will find many different survey sites. Check them out thoroughly before registering. Some of them offer cash for your surveys. If you are doing this to make money, register with these sites. Other sites offer sweepstake entries instead of cash. Some people like the excitement of entering sweepstakes and they may be more attracted to this type of site. Robert @ The College Investor writes Starting a Million Dollar Business While in the Marine Corps – This week, I sit down with Jeff Morin, who created the website Coins for Anything. The amazing thing about Jeff’s story is that he started his business as a side hustle while he was on active duty in the Marine Corps. Now, he has parlayed his original business idea into a wide variety of products that has made him a young millionaire. Robert @ Entrepreneurship Life writes The Best Place in the World to Start a Business – You’re thinking of starting a business. You’ve thought of some unique ideas, and how you’re going to raise enough money to get started. What you might not have thought about is where you’ll start your business. Robert @ Beat The 9 to 5 writes Why Entrepreneurs Are Afraid of the Truth – Have you ever heard the saying, Nobody will tell you your baby is ugly? It’s true! The same is true with entrepreneurship. I’ve watched and seen too many entrepreneurs crash and burn because they were afraid to admit the truth – their baby was ugly. And, just like with babies, nobody wants to tell them that their idea is terrible! Vanessa @ Cash Cow Couple writes eHealthInsurance Review – Are you overwhelmed by health insurance providers? We wrote this eHealthInsurance review to show you how to easily find the plan that’s right for you. Tushar @ Finance TUBE writes 4 Pieces of Money Advice for Gen X – Although still young there are some of the different ways you can still compare with the future.. This is especially important when it comes to your boring answers when it comes your finances.. You have a word to budget or you have not when it comes to best spend the day. Cat Alford @ Budget Blonde writes Reevaluating My Student Loan Plan – I’ve been taking some time to reevaluate my student loan plan. There are a few reasons why. Here are a few of them. Joshua Rodriguez @ http://cnafinance.com writes How To Protect Yourself From Identity Theft Online – In this post, Joshua discusses ways that consumers can protect themselves from identity thieves online. Learn 4 simple ways to protect your information! Lindy @ Minting Nickels writes Can You Make a Living Playing Poker Online? – Perhaps you went to Vegas with friends and you had a taste of winning it big at the poker table. Mr. Frenzy @ Frenzied Finances writes Home Habits: Do’s and Don’ts of Home Maintenance To Save – In an effort to focus on a more improved budget, the following are just a few things to think about when it comes to home maintenance in order to save. Lazy Man @ Lazy Man and Money writes Found Our Investment Property – Remember a few weeks ago, when I wrote that we were looking to expand the real estate empire, despite our tenant troubles? It didn’t take us long to find the property that I was looking for. Bank Free Credit @ Bank Free Credit writes How Student Loans Can Affect Your Credit Score – A student loan need not damage a person’s credit score. In fact, handled correctly a student loan can help improve one’s credit score. The key is the person’s payment record. Jester @ The Ultimate Juggle writes Your children and technology: how much is too much? – All good things come in small packages. In other words, best to keep everything in moderation than indulge ourselves silly on the things that we like. It doesn’t matter whether you are talking about food, clothes, cars or the latest computer games. Little House @ Little House in the Valley writes Budget Busters – I think I fair pretty well staying on-track for the most part, but there’s always room for improvement! Looking closely at my budget, there are certain things that seem to bust it every time. Some of the most common “budget busters” seem to revolve around food, travel, and bad habits. Don @ MoneySmartGuides writes 5 Simple Ways to Cut Car Insurance Costs – Read my five simple ways to cur your car insurance costs. Perhaps you’ll find something you didn’t think of. Edgar @ Degrees and Debt @ Degrees and Debt writes Dating on a Budget – How to date while staying within a budget! Eva Baker @ TeensGotCents writes Reaching For the Stars – Astronaut Abby – Sometimes I google everything I can think of related to teenage bloggers – and sometimes I find someone brilliant like Astronaut Abby! Take a look! Wayne @ Young Family Finance writes The Light at the End of the Financial Tunnel – Hitting a financial wall? Stuck and don’t know what to do? Read here for some great advice to find the way through your financial troubles. Crystal @ Budgeting in the Fun Stuff writes Staying on a Budget in High Cost of Living Areas – Unlike my buddy Crystal in Texas, I left the area right after college for grad school in Pittsburgh. At the time, I thought that was outrageously expensive but DC is worse. It’s hard to keep a budget for me here, read why. Jacob @ Cash Cow Couple writes How to Lower Your Electric Bill to Zero – Tired of $300 electric bills? Come check out our advice on how to lower your electric bill to under $50 per month. Harry Campbell @ Your PF Pro writes Get 2 Free Months of Health Insurance Through COBRA – Quitting my job has turned out to be a great decision. Although I really enjoyed working for my last company, I was ready for a change and once we found out that my fiancee had gotten into med school in Irvine, we started planning for our move. Taking time off from work has allowed me to really focus on all of my online entrepreneurial activities and although I’m making a lot less than I was at my day job, I’m also working a lot less. Harry Campbell @ The Four Hour Work Day writes One Stream of Income is Never Enough – I’ve had more jobs than I can count since I ‘officially started working’ at the age of 14. And I say officially because I was always hustling as a kid. There were the ordinary things like lemonade stands and selling my old junk at our family’s yard sales but I could get pretty creative when it came to making money. In high school, I remember asking my mom to give me extra bags of chips and snacks in my lunch so that I could re-sell them to my classmates for 75 cents or even a dollar. IMB @ Investing Money writes Getting Technical – Investing in the markets can be a challenge, but we can make it easier. Read here for tips on investing and how to invest in the markets today. Tushar @ Earn More and Save writes Financial Foundations: Creating a Filing System for Financial Success – When it comes to saving money there are the normal pieces of advice like skip the lattes, use coupons, and set up automatic deposits to your savings account. These are great pieces of advice but you need to have your financial foundation set up first. Minimalist @ Minimalist Finance writes Ways to Save When You Are Travelling – Ways to Save When You Are Travelling has been published on Minimalist FinanceTravelling is one of the most worthwhile activities. Most people learn so much about other cultures and ways of doing things when they travel, and seeing the world is important in understanding many issues and points of view. Jon Haver @ http://www.paymystudentloans.com/ writes 3 Worst Kinds of Student Loans – Most college students have a student loan to get through their undergraduate work. It’s pretty common, and loans are easy to get. There are, however, certain loans that are better than others. Jon Haver @ Pay My Student Loans writes 3 Worst Kinds of Student Loans – Federal loans have certain rights and responsibilities that most students can live with. All in all, you can be pretty safe with them in terms of refinancing, consolidating, and extending your payment time. But you have to pay them back. It’s not a gift. John @ Ourinsurancecanada.com writes 7 Benefits Of Using an Insurance Agent To Buy Insurance – A lot of people are clueless when it comes to buying any type of insurance. Some people like to look on their own for what insurance they need, but sometimes people don’t even know where to start. These type of people are the ones who should turn to an insurance agent to find the right insurance for them. Hank @ Money Q&A writes Don’t Be Kept In The Dark About The Costs Of Investing – The more oversight, personal involvement, and attention you give to your portfolio, the better positioned you’ll be. Understanding the costs of investing becomes easier for investors with the more you learn. Daisy @ Suburban Finance writes Saving Money On Food – This article will describe how to save money on food and in the grocery store to ensure that you are saving as much as possible and eating on the cheap. Matt Becker @ Mom and Dad Money writes The Peer-to-Peer Lending Numbers They Don’t Want You to See – I see a lot of glowing reviews of peer-to-peer lending extolling the high short-term returns earned by the people singing its virtues. These reported returns have always seemed a little fishy to me, so I decided to dig a little deeper. Today, I want to share some of the results I found that the peer-to-peer lending marketers hope you never see. Tony @ We Only Do This Once writes Downsizing Within Your Home – After our wonderful 7 weeks in Vermont this summer, our family returned to Jersey and instinctively began to get rid of stuff yet again. We have spent the past 2 years seriously decluttering, yet somehow there was even more to do. After almost two months in a small cottage with mostly only necessities, the exercise seemed pretty fluid this time around. Bargain Babe @ BargainBabe.com writes Save Money On Groceries: Stop Buying These Foods – Save money on groceries by never buying these 25 foods again. You’ll be surprised how much money you can save! Taynia Aarnink @ The Fiscal Flamingo writes 6 Simple Ways To Make A Little Moolah (Without Sacrificing A Ton of Time) – There are a ton of ways to make some side cash. It’s a smart thing to do as we approach the holiday season. But your schedule is already jammed pack. I’ve got ya covered. Here are six methods to make a little moolah without sacrificing a ton of time. Hint: may involve Pinterest! Amanda Grossman @ ReadyForZero Blog writes The Top 5 Mental Challenges of Paying Off Debt and How to Cope with Them – The hardest part of getting out of debt is not always the math and sometimes it’s not even the money. The greatest challenge is often perseverance. This post takes on the common mental challenges of paying off debt so you can tackle the challenges and then your debt! SBB @ Simple Budget Blog writes Meeting the Mouse: Budgeting a Trip to a Disney Park – Going on a Disney vacation? Great! Time to budget. Read for the budget categories you need to fill up in order to head out to one of the Disney parks. Nick @ A Young Pro writes Which Budgeting System is Right for You – Do you hate the “B” word? I used to hate budgeting too and I learned to use a budgeting system. Now my budget is a breeze. Joe Saul-Sehy @ Stacking Benjamins writes Get Out of Debt Faster – Is It Time To Reconsider The ARM – When is the right time to buy an adjustable rate mortgage? This piece discusses when and how an ARM is appropriate. Carmen @ Gajizmo writes Random Acts of Kindness – Sometimes we all get so caught up in improving our own lives (finances, family, career, education, health, etc.) that we forget to give back to our community. For this reason, Gajizmo.com donates all ad revenue to charity or uses the funds for random acts of kindness. In keeping with our mission, here is a list of 101 random acts of kindness ideas. If we all do one random act of kindness daily, we just might set the world in the right direction. Grayson @ Debt Roundup writes How You Can Get Rich Quick – The Truth Of Making Fast Cash – So, you want to know how to get rich quick? Doesn’t everyone! I wanted to write this to show you how you can get rich quick and live the life you have always wanted. You might love those late night infomercials telling you that if you buy their book or course, they will show you how to make so much money that it will be mind boggling. The only problem is that those people are the only ones getting rich quick. I am going to show you the real truth about making money fast. MR @ Money Reasons writes Last Quarter Cash Flow Changes – Time to make some cash flow changes for the rest of the year as I come to the realization that my numbers don’t make sense. See how I adjusted my financial planning model accordingly. Corey @ 20s Finances writes Tips for Landing a Job Through Craigslist – Learn three practical steps to help you get a job through craigslist. You’ll be amazed at how easy it is to stand out from others. Mrs. Accountability @ Out of Debt Again writes When to Upgrade… And When Not To – I think it’s so easy to get swallowed up by the promise of upgrades – of getting larger meals or longer warranties or more discounts – that it becomes hard to resist following the herd. Mike Collins @ Wealthy Turtle writes How to Lose a Customer in Two Seconds Flat – The customer may not always be right but if you’re not making an effort to keep your customers satisfied why would they want to bring their business to you? Crystal @ Married (with Debt) writes Transitioning to One Income – One of the most interesting changes my family is facing is a transition to one income. Ryan @ Cash Money Life writes Could the Pomodoro Technique Help Your Productivity? – Have you tried the Pomodoro Technique for time management and productivity? It uses timed bursts of focused energy followed by a timed break. It works! Michelle @ The Shop My Closet Project writes Using up my stuff, and debt pay off updates! – Ok, I’m going to admit that I’m beginning to be a little alarmed by how much product I apparently have. Several months ago I decided not only to stop shopping for clothing items, but to use up the product that I have. I’m looking forward to picking up the pace on my debt repayment during the cold weather months. Esther @ Bons Vivants Blog writes Don’t run out of money half way through the month – Whether you have a small budget or a large one- sticking to it can be quite hard in the face of temptation! Laurie @ Frugal Rules writes Paying Off Debt: Make the Hard Choices – When you’re actively paying off debt you can be often faced with decisions you’d rather not have to make. While it may be hard in the short term, the long term goal of having your debt paid off is much more important. deacon @ Well Kept Wallet writes Best Place to Hide Money Around Your home – Sometimes you want to have cash around the house so that it easy to access, however, you don’t want just anyone to be able to find it. Perhaps you have found your own hiding places over the years but they are not as safe as you would like them to be. Here is a list of some of the best places to hide money around the house using products that can blend into any houses decor. Paul @ The Frugal Toad @ The Frugal Toad writes 5 Reasons Why You Shouldn’t Expect an Inheritance – Many adult children expect to receive an inheritance from their parents. Recent studies suggest a drastically different scenario. Not only will most retirees not leave an inheritance to their children, they will have a difficult time making ends meet in retirement. Here are several reasons why expecting an inheritance might not be in your future. Mr.CBB @ Canadian Budget Binder writes The Costs Of Being Too Nice – How far will you go to please people? It’s not easy to say no to people especially if they are your loved ones. Read 2 stories about a mother who would do anything for her children and a second story about a father to a young girl who he spoiled and how he is tired all the time yet keeps trying to make everyone smile. Pauline @ Make Money Your Way writes How I made $1,000s thanks to my mum – I explain how I made $1,000s thanks to my mum referring some work over to me, and how you should use your network to make more money. Michelle @ See Debt Run writes The City of Lost Wages – Visiting Las Vegas is like going to another planet. But a quick look around lets you see clearly why they call it the city of Lost Wage. That said, visiting Vegas is a great way to spend a quick weekend and as long as you are smart and set limits for yourself, you can have a great time. Pauline @ Reach Financial Independence writes Would you buy a 5 bedrooms, $100 house? – Detroit is dirt cheap, is it time to invest? ALICE @ OnBetterTerms writes The Cost of Traveling with an Infant – Find out some cost-saving methods to travel with your baby. Baby equipments can cost a lot even if you buy just the necessary things! Thomas @ Mr. Moneyvator writes Residential Real Estate Investing in Great Britain – Buy investment properties in the UK! Glen Craig @ Free From Broke writes Is My Employer’s Life Insurance Enough for Me? – Does your employer offer life insurance? If so that’s a nice perk but you need to see why that probably isn’t enough for you. Arnel Ariate @ Money Soldiers writes 5 Ways to Save on an Engagement Ring – While spending on engagement rings may seem steep to many, luckily, there are some techniques to getting around the social faux pas. So if your wife-to-be is stressing you to spend all that on a ring, follow these tips. The Carnival of Money Pros is brought to you to by the Money Pros Team, and you can submit articles at Blogger Carnivals. Awesome carnival – thanks for including mine! Keep up the great work over here. Thanks for hosting and including me! I’m getting hungry looking at your picture. Hope you had fun in NO! Thanks so much Rich for including my article. Super appreciate it. Have a great weekend. Lucky you! New Orleans is one of my favorite places to be! Love the carnival! What a great selection of posts from around the web!